Estee Lauder’s new Sculpting Foundation Brush is a short hair brush with a unique sickle-like toe shape. Happy New Year Brush Lovers! Below, Victor Salazar of the Makeup Talks vlog gives a review of Estee Lauder’s Sculping Foundation Brush, a unique brush with a time-saving design that is a very innovative in several respects. If you haven’t taken a closer look at this brush, we strongly encourage you to do so. The hair – we think it’s goat – is very stiff and short and in a unique sickle shape. The wide curved toe allows you to sweep foundation onto the skin very quickly, especially because the shape hugs the face. What’s more, the higher point of the brush hugs under the eye in a most unique and splendid fashion. When the brush is held so the toe is held more vertical to the face, it’s very much a straight line, which allows you to apply product in between the brows in a neat way and on the side of the nose. 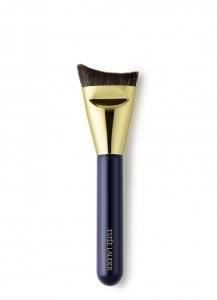 Other highlights: The brush feels nautical, dressed in classic navy, the ferrule in gold. The handle is substantial. All together, a special brush. We love this brush and have been reaching for it every day since it showed up during the holidays.